In 2010, Ulrich Spiesshofer attended a number of pivotal board meetings at ABB, the Swedish-Swiss conglomerate he had joined five years previously. Its robotics division, which Spiesshofer was then heading, had recently posted an operating loss of almost $300m (€254m), and many executives were keen to get rid of it. Spiesshofer, however, was not one of them. In a recent interview with the Financial Times, Spiesshofer reiterated his belief in the “end market” of ABB’s automation portfolio. So, instead of scrapping the division, he set about expanding it, broadening its market beyond merely supplying robots to the automotive sector and investing in artificial intelligence. Fortunately, the gamble paid off. Today, ABB’s Discrete Automation and Motion division generates in excess of $8bn (€6.8bn) in revenue and employs more than 29,000 people. Spiesshofer, meanwhile, is now tasked with keeping all of ABB’s sprawling products and services on track. The ABB Group can trace its origins all the way back to 1883, when Ludvig Fredholm founded Elektriska Aktiebolaget, a dynamo manufacturer, in Stockholm. Many mergers and acquisitions followed, with the ABB Group eventually emerging in 1988 when two rival industrial firms combined. Although there have been plenty of ups and downs along the way, the company has, for the most part, been able to constantly reinvent itself in the face of changing market conditions and shifting consumer demands. In the 20th century, the two companies that would go on to become ABB, ASEA and Brown Boveri, helped to electrify Europe’s railways, create nuclear power generators and support the burgeoning environmental sector. Now, under Spiesshofer, ABB is moving towards a digital-first approach while remaining true to its industrial roots. In particular, ABB has been keen to push long-established industries like utilities, mining and manufacturing into the digital age. ABB Ability, the company’s cross-industry digital solution, has been used to boost security, efficiency and cost savings. In the mining sector, ABB Ability has integrated data and real-time optimisation to increase the performance of more than 600 mine hoist solutions and 720km of belt conveyor systems. In petrochemicals, ABB has used digital products to reduce the demand on safety systems and automate data collection. For Spiesshofer, it is clear that industry knowledge is important. 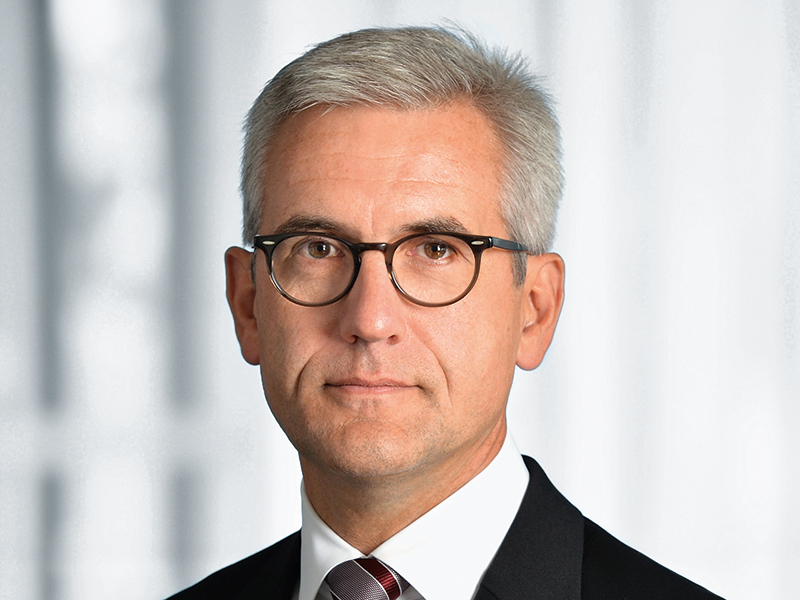 Before becoming ABB’s CEO in 2013, Spiesshofer had already amassed nearly a quarter of a century of experience in the realm of business management. But experience can also be paralysing; it is only truly useful when aligned with an unwavering commitment to innovation. By embracing software and digital tools, ABB has transformed itself from a fledgling Swedish dynamo manufacturer into an international player in new industries like smart buildings and data centres. Although Spiesshofer has worked across a number of businesses and industries, he is best known for turning around ABB’s robotics division. Before the CEO’s intervention, the division was occupied with supplying robots to the automotive industry, which has traditionally been the largest recipient of automation services. Today, however, ABB’s automation department works in industries as diverse as utilities, mining and transportation. ABB’s commitment to robotic innovation can best be observed through the company’s miniature circuit breakers (MCBs), a product the firm has been making for more than 90 years. The humble production line that would have originally been used to create these tiny gadgets has now been revolutionised through a combination of automation, data analytics and the Internet of Things (IoT). The company’s intelligent factory in Heidelberg, for example, now employs seven ABB robots to create MCBs, with each one automatically adjusting to the previous stage in the production process. These robots are self-learning and flexible, helping to boost productivity at the factory by three percent since their introduction. Similarly, ABB now utilises an automated shore connection robot in its marine transport division, and automated technology is used to help with food packaging. 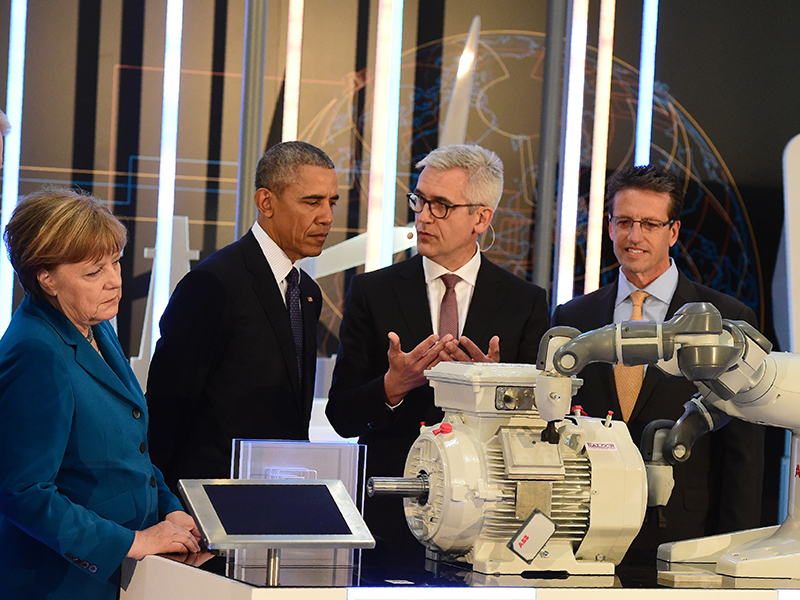 For Patrick Schwarzkopf, Director of EUnited Robotics, it is easy to see why ABB has broadened its robotic output. However, the decision to hold onto ABB’s robotics division cannot be wholly attributed to excellent foresight on Spiesshofer’s part. In fact, the entire automation industry began to experience rapid growth around the same time a sale was being considered. Between 2010 and 2015, the average worldwide annual supply of industrial robots rose to approximately 183,000 units, an increase of around 55 percent when compared with the years immediately following the global financial crisis. So, perhaps Spiesshofer benefitted from a lucky break. On the other hand, maybe a forward-thinking CEO simply makes his own luck. One of the ways in which Spiesshofer has taken advantage of the booming robotics sector is to take his company into new markets. ABB is now active in Europe, the Americas, Asia and Africa, with emerging markets representing 46 percent of its orders. The robotics division currently operates across 53 countries, but the industry’s broader growth has also brought renewed competition – particularly from the Far East. In Japan, FANUC currently holds the title of the world’s top provider of robotics and automation, while Chinese businesses like KUKA are also seeking to increase production. Spiesshofer, however, has decided to fight fire with fire, and is planning to double ABB’s robot capacity in China in order to become the world’s biggest supplier of industrial automation equipment. The competition may be fierce, but ABB appears ready for it. But if competition from abroad isn’t worrying ABB, it goes without saying that its employees – and those of many other companies – are growing increasingly concerned with the newly emerging rivalry. Robots, aside from providing huge productivity benefits, also raise significant concerns over job losses. For Schwarzkopf, these anxieties are completely genuine, “[even when data shows] automation is more likely to have a positive net employment effect”. As technology becomes an increasingly central part of our lives, Spiesshofer and his company have been quick to curb fears of robots stealing jobs. 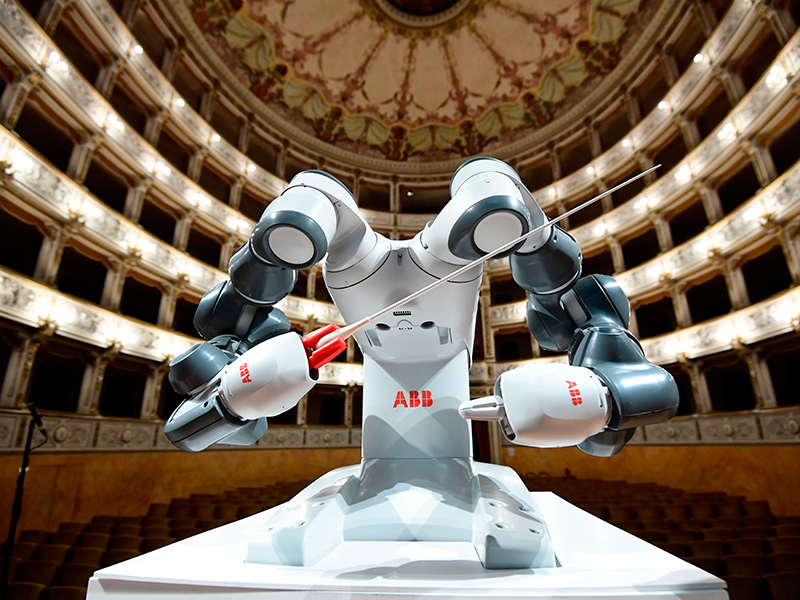 Currently, ABB’s star attraction is YuMi, a dual-arm robot that is intuitive, precise and, most importantly, safe. With its padded arms and dextrous grippers, it is equipped to carry out specific tasks without endangering its human colleagues. In ABB’s Low Voltage Products plant in Jablonec nad Nisou, Czech Republic, YuMi works alongside a human operator on the assembly process – providing assistance, not competition. The ABB CEO has also been at pains to quell any lingering fears about automation-related job losses. In an interview with CNBC in 2017, Spiesshofer reiterated his belief that employment, prosperity and wealth go “hand in hand” with automation. Unlike many companies involved in this sector, ABB and Spiesshofer prefer to talk of “co-bots” – automatons that bring prosperity and wealth to countries, not rampant unemployment. Even as Spiesshofer looks to grow ABB’s automation division, he must also keep a close watch on the company’s many other products and services. The Zurich-based conglomerate currently operates in the chemical, cement, power distribution and data centre industries, among many others. Tasked with giving this complex, sprawling company a focus, perhaps Spiesshofer’s greatest success has been recognising the synergy that exists between the ABB Group’s disparate businesses. In fact, the CEO has often stated he believes the company should remain a conglomerate, even facing down investor pressure to sell parts of the portfolio. Spiesshofer understands that, even though industries may appear to have little in common initially, the scale and technology at ABB’s fingertips can be put to good use in a broad range of industries. ABB’s power distribution solutions, for example, are being harnessed by data centre operators and steel producers alike. Its robotic offerings are proving just as useful for metal fabrication as they are for pizza factories. What’s more, some of ABB’s core offerings, including automation, renewable energies and data analytics, look set for continued growth in numerous markets over the coming years. There also appears to be little danger of ABB slowing down. In September, the company committed to purchasing General Electric’s Industrial Solutions business for $2.6bn (€2.2bn). The following month it won a $130m (€110.3m) contract to build the power transmission infrastructure at the UK’s Hinkley Point C nuclear power station. ABB has also agreed to partner with Swedish firm Northvolt to build Europe’s largest battery factory, with production due to begin in 2020. Given ABB is such a large company, with so much going on at any given time, it requires expert management and precise organisation to keep things from unravelling. Spiesshofer’s calm approach to business comes across at all times, particularly when confronting challenges. In Europe and the US – two of ABB’s key markets – uncertainty related to Brexit and the Trump administration provides an ongoing cause for concern. Likewise, low oil prices have hit parts of the business hard. Instead of viewing these hurdles with trepidation, Spiesshofer prefers to take an optimistic approach, believing that much of the uncertainty will be short-lived. To protect against market volatility, he has implemented a $1bn (€848.8m) savings drive, while he has also helped to streamline the company by halving the number of individuals that make up his senior management team. As Spiesshofer looks ahead to the future, there remains plenty to juggle – not least of all the management of a company that employs more than 130,000 people and has revenues in excess of $30bn (€25.5bn). Just as with ABB’s robotics division seven years ago, there will be significant pressure to divest parts of what is a huge business. Spiesshofer’s determination and singular vision, however, means he will always put ABB’s long-term future ahead of a quick buck.